Two great gifts for someone who is into keeping their nails looking polished and healthy – OPI’s Nail Envy along with a good quality manicure kit such as Tweezerman’s mini manicure kit. I personally love a good quality handcream, so a lovely treat I would recommend for someone would be a tube of L’Occitane’s ‘cherry blossom’ hand cream; the quality and the cherry blossom scent combined just make heaven in a tube! 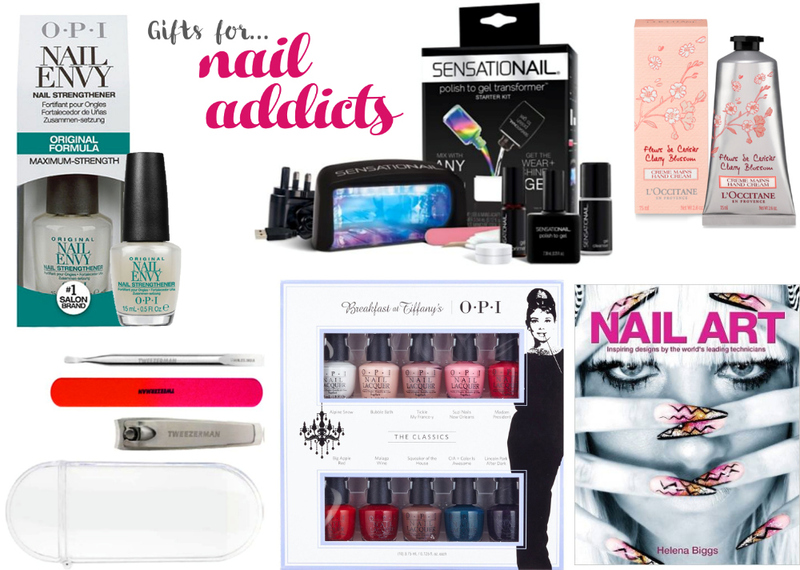 Of course what gift guide for nail addicts would be complete without some nail polish?! OPI is one of my favourite brands of nail polish, and this ‘Breakfast at Tiffanys’ collection contains 10 mini classic shades which you can’t really go wrong with. If you know someone who prefers brighter shades, the Mavala bright trio would be a good choice. So many people are into nail art these days, gone are the days where it is only done by nail technicians. This ‘Nail Art’ book is full of ideas for those who are into doing their own nail art and would provide them with tons of ideas and inspiration to get creative with their nails. My big ticket item if you really want to treat someone would be the SensatioNail polish to gel starter kit. I have this myself and it is amazing. If you know someone who would love to get into doing gel nails but is reluctant to buy all gel polishes due to the size of the their collection of regular polishes, this kit is for them. It uses regular nail polish to create gel manicures and it is just brilliant; it contains everything you need to get started. If there is one item from this list I would choose as my number one pick – this is definitely it!